The Element Table brings flexible design and style at an economical price. 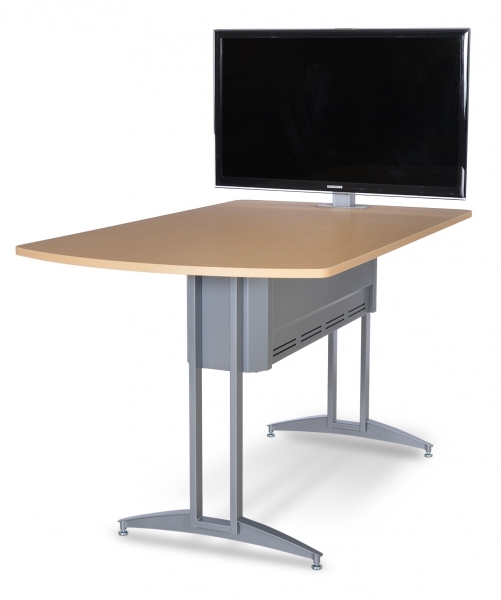 The Element is a clean, simple, and elegant table, perfect for any education or corporate setting. Individuals become team players in the collaborative environment created with the InVision Element. 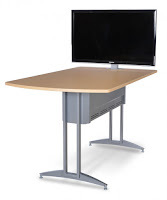 The variety of heights and lengths gives great flexibility to fit any need or space including libraries, classrooms, conference rooms, and collaboration areas and is as comfortable in the corporate environment as it is in the classroom. Available in a designer T-leg with fixed heights of 27”, 30”, and 42” and a post leg available in 27” and 30”. Options of 60”, 72”, or 96” lengths offer further flexibility to fit all needs with a one piece 42” wide worksurface is made with high-pressure laminate on 1” engineered wood, making it one of the most durable tables in the industry. Choice of a 7” wide wire tray or a larger 11” x 16” AV Equipment Channel, available on the T-leg only, to fit all your technology needs. An optional affordable display stand, which can hold up to 100 pounds, adds group visualization on projects and presentations.